Tripolitania /trɪpɒlɪˈteɪniə/ (Arabic: طرابلس‎ Ṭarābulus, Berber: Ṭrables, from Vulgar Latin *Trapoletanius, from Latin Regio Tripolitana, from Greek Τριπολιτάνια) is a historic region and former province of Libya. 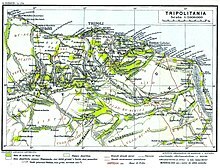 Tripolitania as a subdivision of Libya 1934–1963. Tripolitania was a separate Italian colony from 1927 to 1934. From 1934 to 1963, Tripolitania was one of three administrative divisions within Italian Libya and the Kingdom of Libya, alongside Cyrenaica to the east and Fezzan to the south. The region had been settled since antiquity, first coming to prominence as part of the Carthaginian empire. Following the defeat of Carthage in the Punic Wars, Rome organized the region (along with what is now modern day Tunisia), into a province known as Africa, and placed it under the administration of a proconsul. During the Diocletian reforms of the late 3rd century, all of North Africa was placed into the newly created Diocese of Africa, of which Tripolitania was a constituent province. After the Fall of Rome in the 5th century, Tripolitania changed hands between the Vandals and the Byzantine Empire, until it was taken during the Muslim conquest of the Maghreb in the 8th century. It was part of the region known to the Islamic world as Ifriqiya, whose boundaries roughly mirrored those of the old Roman province of Africa Proconsularis. Though nominally under the suzerainty of the Abbasid Caliphate, local dynasties such as the Aghlabids and later the Fatimids were practically independent. Native Berber people, who had inhabited the area locally for centuries before the arrival of the Arabic peoples, established their own native Hafsid dynasty over Ifriqiya in the 13th century, and would control the region until it was conquered by the Ottoman Empire in the 15th century, who established Ottoman Tripolitania as a distinct province. In the old system, Tripolitania included Tripoli, the capital city of Libya and a vast northwestern portion of the country; in the subsequent systems, the sha'biyah of Tripoli has become much smaller than the original Tripolitania, including merely the city of Tripoli and its immediate surroundings. Because the city and the sha'biyah are nowadays almost coextensive, the term "Tripolitania" has more historical than contemporary value. In Arabic the same word (طرابلس) is used for both the city and the region, and that word, used alone, would be understood to mean only the city; in order to designate Tripolitania in Arabic, a qualifier such as "state", "province" or "sha'biyah" is required. The system of administrative divisions that included Tripolitania was abolished in the early 1970s in favor of a system of smaller-size municipalities or baladiyat (singular baladiyah). The baladiyat system was subsequently changed many times and has lately become the "Sha'biyat" system. The region that was Tripolitania is now composed of several smaller baladiyat or sha'biyat — see administrative divisions in Libya. The city of Oea, on the site of modern Tripoli, was founded by the Phoenicians in the 7th century BC. It was conquered by the Greek rulers of Cyrenaica, who were in turn displaced by the Carthaginians. The Greek name Τρίπολις "three cities" referred to Oea, Sabratha and Leptis Magna. The Roman Republic captured Tripolitania in 146 BC, and the area prospered during the Roman Empire period. The Latin name Regio Tripolitania dates to the 3rd century. The Vandals took over in 435, and were in turn supplanted by the counter offensive of the Eastern Roman Empire in the 530s. In the 7th century, Tripolitania was conquered by the Rashidun Caliphate, and was inherited by its descendants the Umayyads and the Abbasids. The Fatimids, established a Caliphate from Tunisia to Syria. In the 1140s, the Normans of Sicily invaded Tripoli, but were ousted by the Almohad Caliphate in 1158. Emir Abu Zakariya, an Almohad vassal, established an independent state in Tunisia in 1229 and took control of Tripolitania shortly after. The Hafsids would control the region until the Ottoman conquest of 1553. Ottoman Tripolitania (Trablusgarb) extended beyond the region of Tripolitania proper, also including Cyrenaica. Tripolitania became effectively independent under the rulers of the Karamanli dynasty from 1711 until Ottoman control was re-imposed by Mahmud II in 1835. Ottoman rule persisted until 1911–12, when it was captured by Italy in the Italo-Turkish War. Italy officially granted autonomy after the war, but gradually occupied the region. After World War I, an Arab Republic, Al-Jumhuriya al-Trabulsiya, or "Tripolitanian Republic", declared the independence of Tripolitania from Italian Libya. The proclamation of the Tripolitanian Republic in autumn 1918 was followed by a formal declaration of independence at the 1919 Paris Peace Conference (Treaty of Versailles). This was the first formally declared republican form of government in the Arab world, but it gained little support from international powers, and disintegrated by 1923. Italy under Fascist dictator Benito Mussolini managed to reestablish full control over Libya by 1930. Originally administered as part of a single colony, Italian Tripolitania was a separate colony from 26 June 1927 to 3 December 1934, when it was merged into Libya. The Italian fascists constructed the Marble Arch as a form of an imperial triumphal arch at the border between Tripolitani and Cyrenaica near the coast. Tripolitania experienced a huge development in the late 1930s, when was created the Italian 4th shore with the Province of Tripoli and with Tripoli as a modern "westernized" city. The Tripoli Province ("Provincia di Tripoli" in Italian) was established in 1937, with the official name: Commissariato Generale Provinciale di Tripoli. It was considered a province of the Kingdom of Italy and lasted until 1943. During World War II, several see-saw back and forth campaigns with mobile armour vehicles ebbed and flowed across the North African coastal deserts between first Italian Fascists and the British, soon joined by the Nazi Germans in 1941. Libya was finally occupied by the western Allies, the British moving east from Egypt after their victory at El Alamein in October 1942 against German Field Marshall Erwin Rommel and his Afrika Korps, and the Americans from the west after landings in Operation: Torch in Morocco and Algeria in November 1942. From 1942 continuing to the end of the war in 1945 until 1951, when Libya gained independence, Tripolitania and the region of Cyrenaica were administered by the British Military Administration. Italy formally renounced its claim upon the territory in 1947. Tripolitania retained its status as a province in the Kingdom of Libya from 1951 to 1963, when it was replaced by a new system of governorates, which divided Tripolitania into the governorates of Khoms, Zawiya, Jabal al Gharbi, Misrata, and Tarabulus. Modern Latin missionary jurisdiction: Apostolic Vicariate of Tripolitana (later renamed after its see, Benghazi). 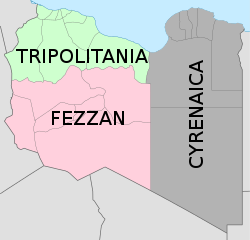 Tripolitania is Libya's most populous region (compared to Fezzan and Cyrenaica). Tripolitania's population has grown throughout years, as has the population of Libya as a whole. 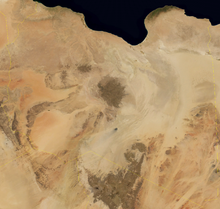 Libya's overall population, however, has grown at a rate slightly greater. Because of this, the percentage of Libya's population living within Tripolitania has decreased. Source: Gathered from bulletins of censuses 1964, 1973, 1995 and 2006. The majority of the population in Tripolitania is of Arab-Berber ancestry. Communities of Berber-speakers lives in the Jebel Nafusa region, the town of Zuwara on the coast, and the city-oases of Ghadames. In addition to Tripoli, the following are among the largest and most important cities of Tripolitania: Misrata, Zawiya, Gharyan, Khoms, Tarhuna and Sirte. ^ 2006 census, based on the sum of population of districts Misrata, Murqub, Tripoli, Jafara, Zawiya, Nuqat al Khams, Jabal al Gharbi, Nalut. ^ Abdel Aziz Tarih Sharaf, “Jughrafia Libia”, Munsha’at al Ma’arif, Alexandria, 2nd ed., 1971, pp. 232-233. ^ "World Statesmen-Libya". Retrieved 12 December 2009.